Humphrey is traditionally done in the summer months as a high elevation hike that offers some relief from the heat and humidity of the much lower elevations (anything under 6000' in my mind). However, I think that is the least attractive time of year to climb the peak. Southerly winds, humidity, pollution and atmospheric dust combine to make the period from April to September the time of year with the lowest visibility: often under 50 miles. Monsoon storms running from late June to mid September raise the threat of injury from lightning, and there is not much worse than being above tree line and getting pelted by hail or a cold rain. Finally, if you take the main trail you should expect to find almost as much traffic as you might have on Phoenix's Squaw or Piestewa Peak Trail. No, in my mind summer is not the best time of year to summit Humphrey. I feel that honor goes to the winter climbing season. In winter there is an entirely new set of challenges that faces the climber. Gone is the need to start early (if you have the ambition to rise before 8am to climb) to avoid monsoon threats. You won't encounter crowds on the peak, and visibility is so good you can see well over 150 miles. 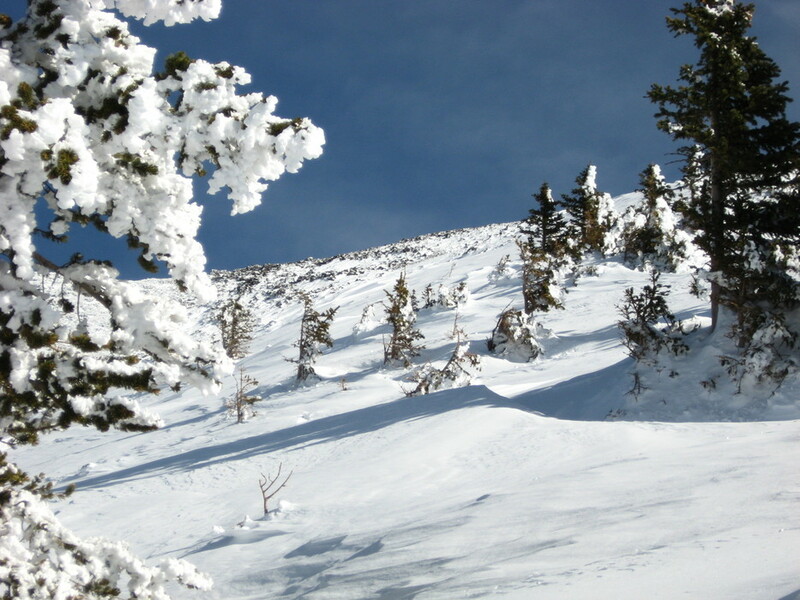 Instead, you may encounter snow up to 10 feet deep, winds may gust to hurricane force, and it is important to choose your route to avoid risking a fall or the potential for avalanche. Avalanche potential is very low if you stick to "known routes". 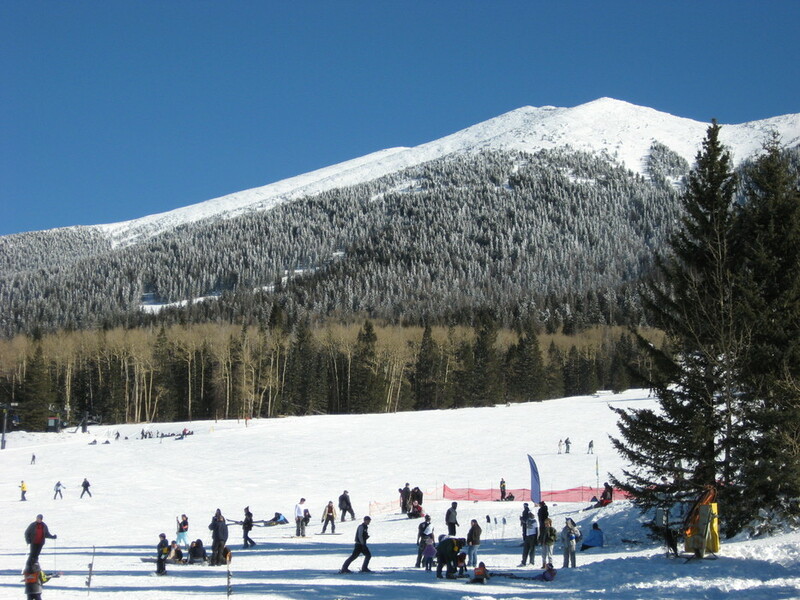 Also, while I feel it is nearly impossible to become lost on the San Francisco Peaks, it is helpful to feel comfortable being completely off trail and potentially alone. 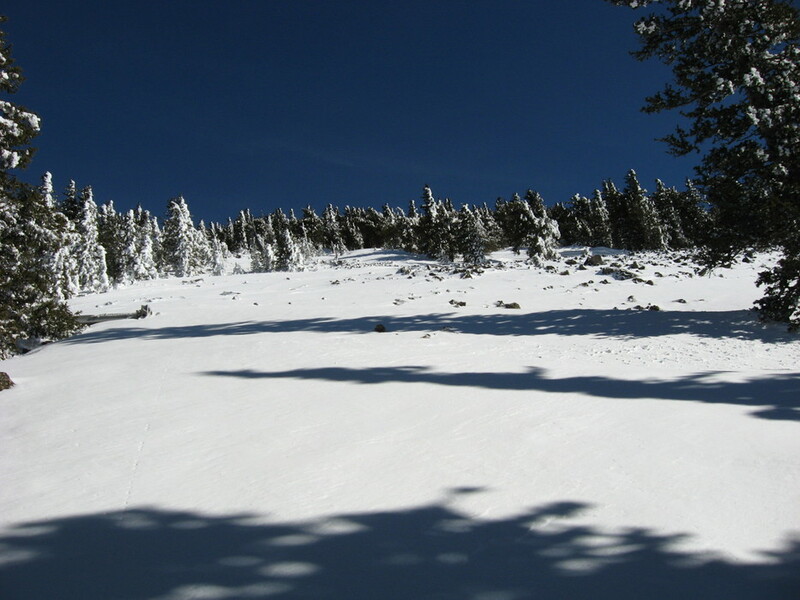 Before you get started it is important to note that the route which I describe and the purpose of this description is to illustrate a climbing route for when the Peaks have a snow pack and Snowbowl is open for winter skiing. 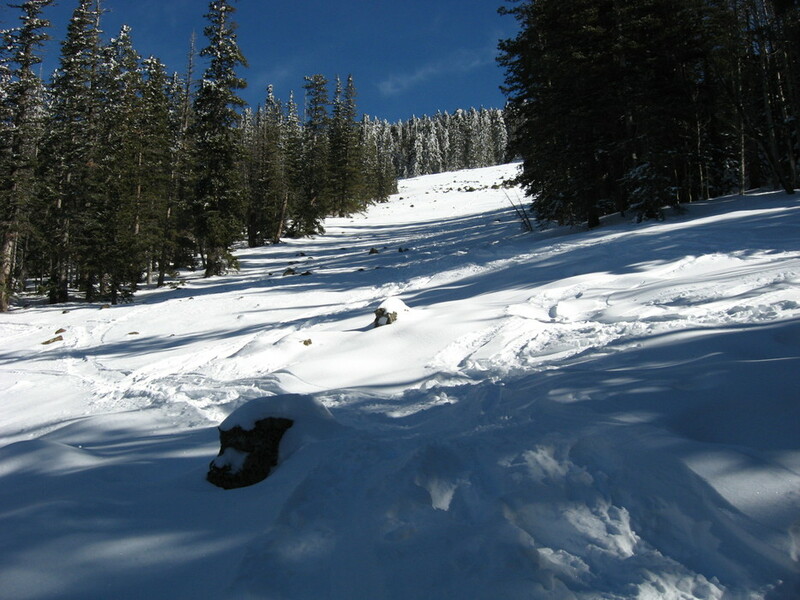 If the ski area isn't open you will either be able to use the main trail instead of this route, or you may not be able to access the trailhead if the road and ski area are closed-typical in the period after the first snows but before the ski season starts. Lastly, in some drier winters this route may be completely unnecessary or impossibly to do. 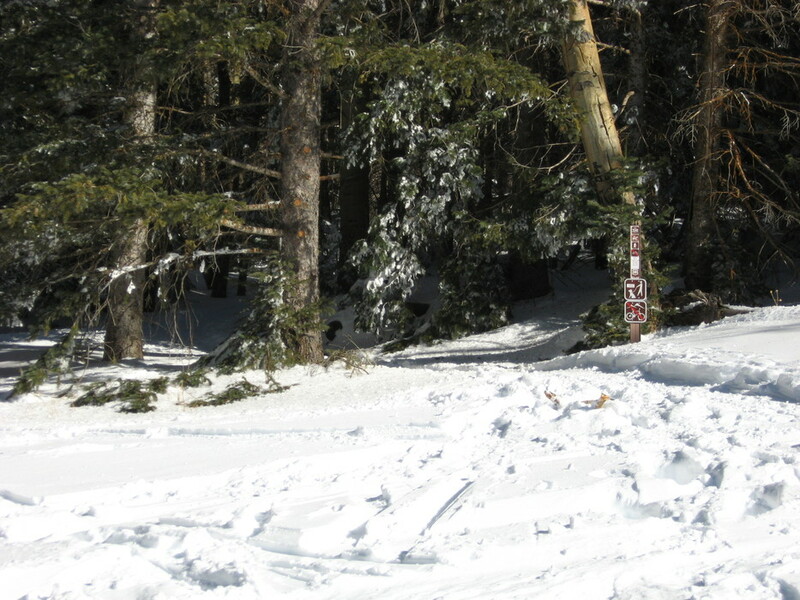 Typically, if Snowbowl has the 3 foot base to open the lower runs, then the route has enough snow on it to be usable. I have done this route with the bare minimum snow pack required to open Snowbowl and even though rocks were sticking out above the snow in the Dutchman the route was still able to be done with snowshoes. 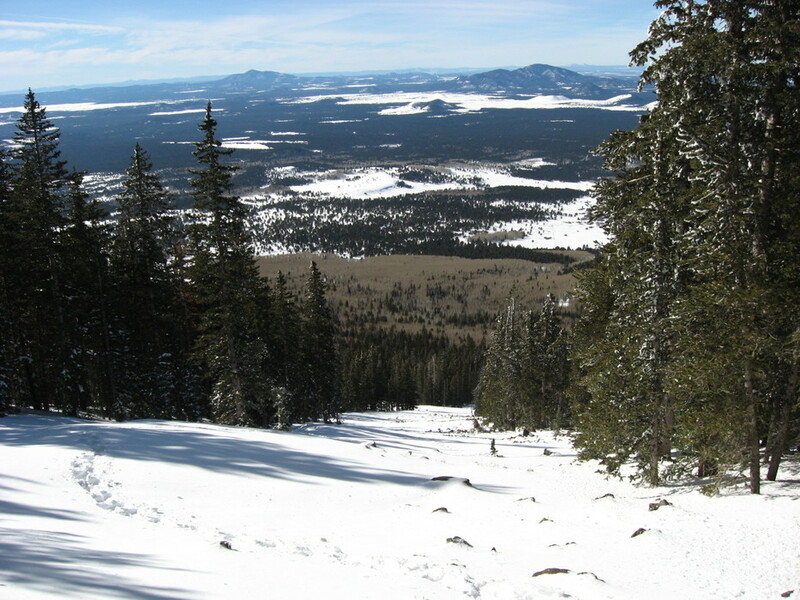 Winter climbing from the Snowbowl area requires a Kachina Peaks Backcountry Permit. You can get one (one is required per person) at the Agassiz Lodge on weekends, or from either of the two Forest Service offices in Flagstaff. They are free, and can save you a good deal of money if something happens that requires rescue. The permit is good for an entire season, so get it early and use it often. The first thing to think about for a winter climb is the gear. In summer all you need is a poncho and what ever clothing you bring on a normal day hike. In winter you will need snow shoes, lots of warm clothing (preferably in layers as you will get hot when going up) and snow boots. It is also recommendable to have an ice axe for steep terrain and a separate crampon for use on the areas where scour has exposed rock. Gators, goggles and a baklava face cover-hat combination are also really good to have. A headlamp or flashlight may be useful if you decide to spend extra time out exploring after the sun set. 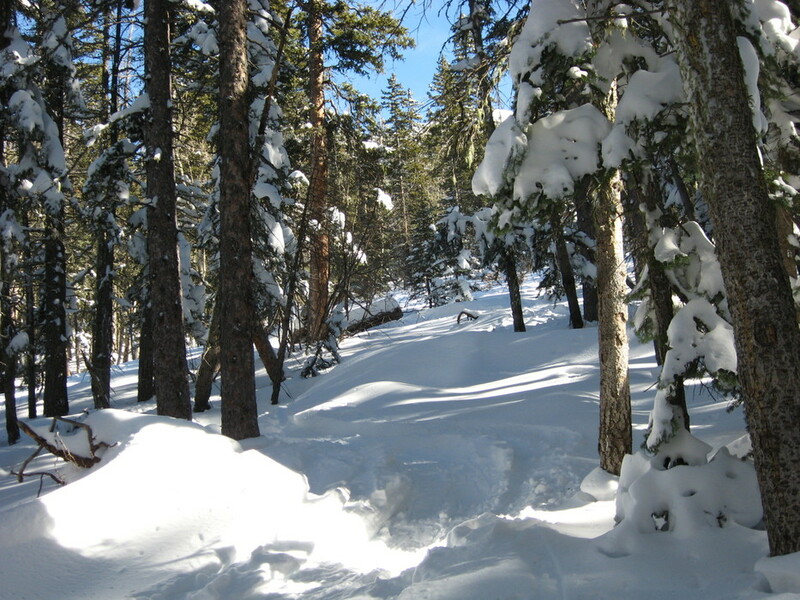 There are numerous places in Flagstaff that rent snow shoes. I recommend a snowshoe with a hard and sharp outer edge to cut into the snow crust on some of the steeper cornices you might have to climb. Some shoes have rounded edge from their tube construction. I have found these to be unsuitable when trying to climb on steeper slopes. I have never seen any stores in Flagstaff that rent or even carry ice axes or crampons. Ironically, the REI in Tempe does carry them. It may not be worth purchasing these extras if you only plan to climb once, but if you think you'll make a yearly ritual out of it then you might want to spend the money for these pieces of safety equipment. Don't bother with aluminum crampons as you'll want the crampon for the rock/ice/snow combination and you'll need steel for that. 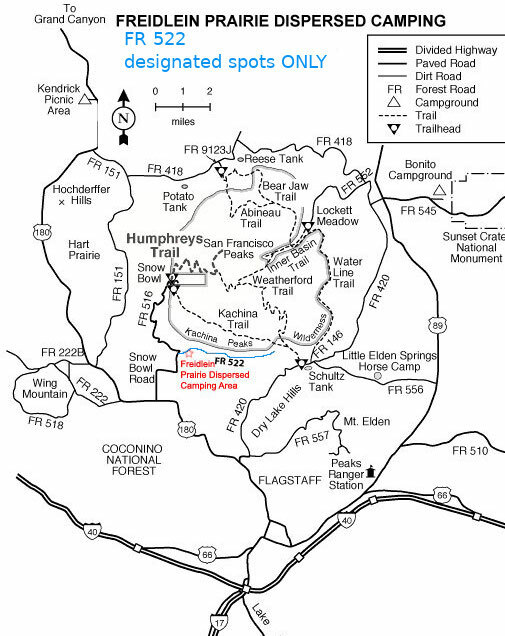 The route to Humphrey is substantially longer than that to Agassiz Peak if you come up from Snowbowl and only do one Peak. Agassiz has about 800 to 900 vertical feet and around 2000 feet of climb above treeline, and you are never very far from safety and the Ski Hut at the top of chair 1 (Agassiz Lift). Climbing Humphrey is not like Mount Rainier or Mount Hood, but you will spend nearly half the climb above the safety of the trees and need to think about conditions up there. The biggest thing is the wind. It can be as calm as zero wind that allows you to hear vehicles on the road, or so windy that you can get blown over, and the ice crystals that are picked up by the wind feel like little razor blades when they impact any exposed skin. The key is picking the right conditions so as to minimize the risk of having high winds. I found that the period after a cold front has passed and a high has settled in is best. You want to allow a couple of days to pass after a front moves through to allow for things to settle down. Even still, it can be calm at one point and pretty windy at another. It's mostly just trying to avoid times when the wind is guaranteed to be fierce and hope for the best. You can also dress for the wind by having face protection, since that is probably the only area that you will have as exposed skin in winter. The second item to think about is the base layer of clothing. You'll work up quite a sweat climbing the route. I can't recommend against cotton enough in winter. 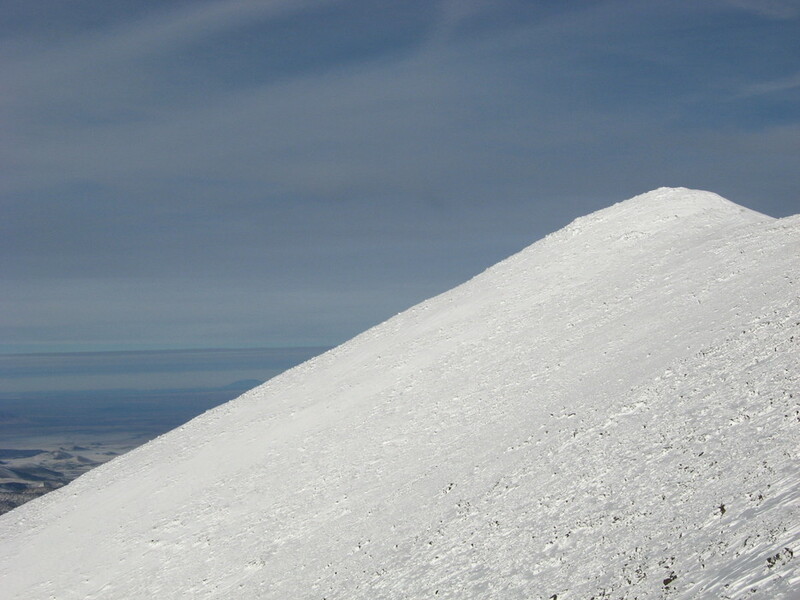 I used cotton for the last time in 2006 when climbing Fremont Peak in November. It would get soaked and I would have to change my shirt or risk being cold. I recommend some sort of synthetic or wool that won't hold the moisture and can still keep you warm when it gets wet. I use Smart Wool and have found it to be really good for winter. It typically dries pretty quickly, too. Other items to think about are boots, gloves, pants, hats and the outer layer or coat. It is mostly preference for these items. There is no need to spend $300 on a serious mountaineering boot for this peak. Anything warm, water proof, and with a high upper will be fine. I the past I used my $100 Sorels and had no troubles at all. Avoid leather gloves. Pants are almost wide open (with respect to choice of type)! However, don't wear cotton pants including jeans. If you have warm long underwear on you don't need heavy or expensive ski pants. Heavy pants may actually be too hot and uncomfortable to climb in. Some recommend large over sized wool pants that you can get from Army surplus stores. I use my Nomex fire pants that I got from my days burning forests for the Army. They are fire resistant, so I needn't worry about them burning me if the snow should become engulfed in flames. More importantly they are large and flowing, they don't hold moisture, and they act as a gator over my boots. The last thing to think about is your hat and coat. I like any hat with cheek covers, and I have a heavy down coat that I like to use. What ever you wear you will want to be comfortable climbing in what could be below zero temps. The Route There are many different routes which one could take to summit Humphrey. The one I describe is heavily used and takes you through the old bomber wreck. This route is likley to have a packed snow trail if a weekend has past since the last storm, and you might find another climbing party out there. I like to start at the summer trailhead because it allows for the most elevation gain from the trailhead to the peak, but you can also start from the Agassiz Lodge. If you start from the lower lot, don't try to use the main trail at first. Instead walk up the ski slope and find the point where the trail from the Agassiz Lodge crosses the ski run and joins the main trail at the sign-in box. If coming from Agassiz Lodge, simply follow the spur trail to the sign-in box. Look for the small brown sign to enter the forest. This next section is the only part that uses the Humphrey's Summit Trail, and it is only this one switchback that is used. 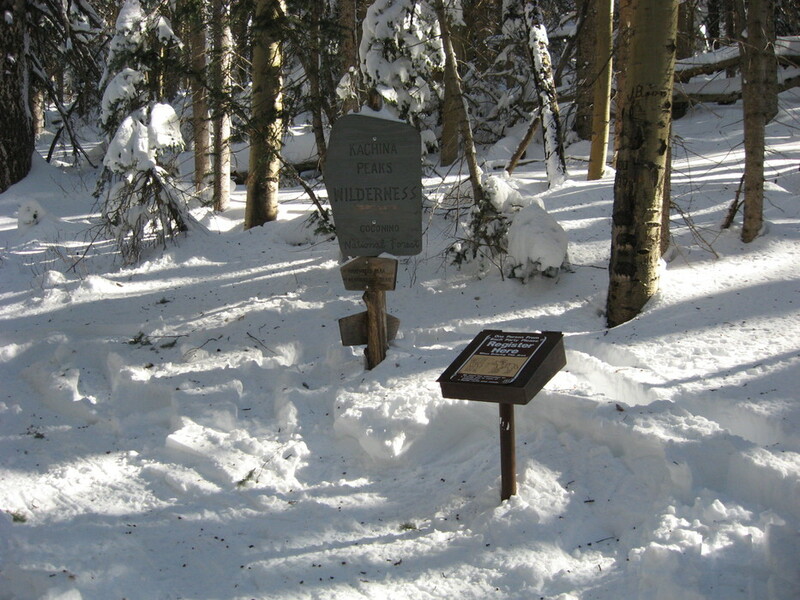 Proceed on trail past the Kachina Peaks Wilderness sign and the hiker's sign-in box. If early in the season the sign and box may be exposed, but in a wet winter they may not be. In late February of 2008 I dug the box out from 2 feet of snow. If snow had continued that year it would have gotten buried further. This is probably rare except in very wet winters. Continue on the trail for 3/4 of a mile. You'll follow the grade and will have a fairly open path. At the end of the first switchback you will encounter an area with a good deal of downed trees. This is where you want to head upslope and off trail. What you want to do here is climb up and to the north to the Dutchman Glade, which is the large rock slide area you spot about half way along the summit trail in summer. Once you reach the bottom of the Dutchman Glade it is a straight shot uphill for about 800 feet. At the top of the glade you want to turn into the woods and head upslope and north. It isn't really very straight forward, but if the goal is to find the bomber wreck you want to go north about 200 to 300 feet and upslope. Unfortunately, you won't see scattered plane parts like you normally do in summer that tell you to go directly upslope. If you miss the bomber wreck or don't care just head for treeline. If you have found the bottom of the wreck it will look something like this. Proceed through it and continue on the treeline. I like to follow the cornice that forms on the north side of the ridge, though you can go any way you like. Eventually, you will reach the top of the ridge and be able to continue on to the summit. Unless going over to Agassiz it is best to descend the way you came. From treeline to the ridge it's an easy climb up to the main trail and on to the summit. Well, easy is relative. 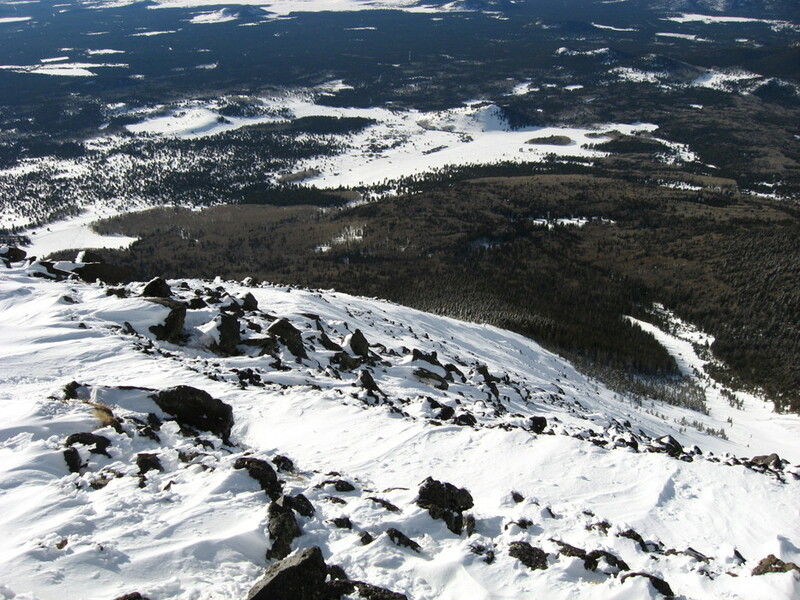 Above treeline is also the area that is the most difficult and dangerous to travel through in bad conditions. It isn't more than 1000 vertical feet from treeline to the summit ridge. Once on the summit ridge it is a very easy hike to the summit. The only way it won't be "easy" is if it is windy. I've had odd conditions up there where it wasn't windy for almost the entire way up, then as I approached the summit it became extremely windy. I don't understand how that happens. If you do go, leave plenty of time, pack lots of food and water and enjoy the day. From Flagstaff follow Highway 180 West 7 miles to FR516. Turn right onto FR516 (N. Snowbowl Dr) and follow 6.2 miles to the first large signed parking lot on the left.